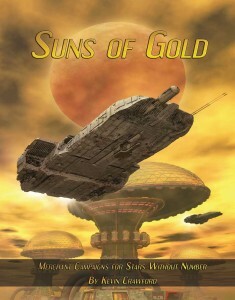 Suns of Gold is now available at DriveThruRPG, serviceable for all your reckless space-mercantile needs. They are merchants, thieves, grifters, saviors and worse. They roam the untamed void to bring the wealth of foreign worlds to their customers, trading in the treasures of half a hundred worlds for the sake of riches beyond human imagination. You will find them in dirty starport dives, in the palaces of lostworlder kings, and in the gleaming towers of their corporate palaces. They are the far traders, and the treasures of the sky are theirs for the taking. Suns of Gold will give you everything you need to handle the commercial ambitions of your players, from short-run cargo hauls to interstellar trade empires. Unleash the forces of fearless avarice in your campaign, and seek the wealth of the skies! Previous PostNew Freebie: The Yellow Bone LegionNext PostA Crimson Hour Draws Nigh….